Ann Arbor Public Schools board of Education (March 13, 2013): The meeting was highlighted by reviews of two district programs: (1) the Student Intervention and Support Services (SISS) program; and (2) the Roberto Clemente Student Development Center. The trustees seemed to be unimpressed with the SISS report – because not enough quantifiable data was presented. They asked the SISS team to come back with a more data-rich report at a future meeting. Alesia Flye, deputy superintendent for instruction, presented the review of Roberto Clemente. The administration’s ultimate recommendation was to relocate the Clemente program to Pioneer High School beginning the fall of 2013 – for an estimated savings between $127,379 and $348,677. This was presented to the board as an information report. No action will be taken until the budget is finalized later on this year. The board also discussed and unanimously approved a resolution to support three students who are currently facing criminal charges for their alleged roles in the Huron Pioneer football brawl. Also at the meeting, the trustees also approved 2013-14 School of Choice (SOC) openings, which will be opened up on April 8 until May 8, 2013. Despite recommendations from the administration against it, the trustees approved 25 spots to be opened at Skyline High School for incoming ninth graders. The board also formally approved a $2.5 million budget adjustment to cover lower-than-projected revenues and greater-than-projected expenses through the first half of the current budget year. Upcoming budget decisions and anticipated cuts were also a prominent theme of the meeting. The board set a schedule for public forums to take place over the next month. And students who participate in the theater program addressed the board asking trustees not to cut support to that program. 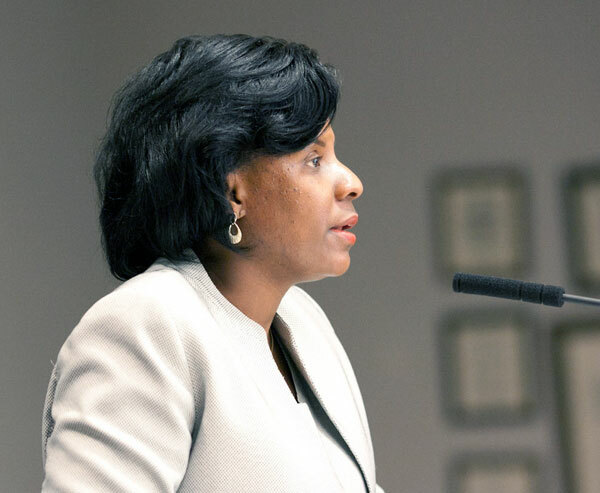 As part of superintendent Patricia Green’s effort to have each department present an annual report to the board, the team – led by Elaine Brown, assistant superintendent for SISS – presented a review of the program. Brown emphasized the committee was made up of a wide range of stakeholders, including SISS administration, teachers, and parents. The report itself touched on a literature review of recent special education mandates and strategies, the data collection tools used for the report [which were primarily site visits and interviews], trends and patterns, major findings, and recommendations. Committee concerns were also noted. The review culminated in a summary of the areas that should be addressed in the 2012-2013 school year and subsequent years. After noting that there seemed to be a discrepancy of services from school to school, the team identified several areas that needed improvement. Elaine Brown, assistant superintendent for student intervention and support services. The Achievement Team Process (ATP) was described as not being well understood by staff and not consistently implemented. Curriculum and instruction, as well as need for more collaborative planning time, were also noted as focus areas. While communication between staff and parents was an area staff felt they were doing well, they felt communication between levels was lacking, which affected student transition between elementary, middle, and high schools. Some of the 22 recommendations included training on the ATP, working to create more collaborative time for teachers, and a review of leveled classrooms. Christia Butler-Ketchum, SISS assistant director, argued that leveling students in general was not necessary. Tracking students leads to confusing a student’s pace of learning with their capacity for learning, she said. She contended that leveling created different expectations for those students. Summarizing the recommendations, Green said a common understanding is needed of the ATP and services available, because when people don’t have the correct understanding of what is needed, “there can be a quick referral to special ed services without understanding the full need.” She wanted to make sure the appropriate services are being provided for the appropriate reasons. While trustees were appreciative of the report, their feelings were best summed up by trustee Andy Thomas’s concerns: Trustees were “struck by the complete absence of any metrics” in the report and were disappointed by the absence of clearly defined goals and next steps. Brown said her team felt they should not repeat information already given to the board in the district achievement report. She reiterated that action plans will be developed and implemented on a yearly basis to address the recommendations put forth by the report. She also noted the report only examined how services were provided and did not take into account the financial implication of the services. In a program review, trustee Glenn Nelson said, it would be helpful to have a broader picture of how special ed fits into the district program. 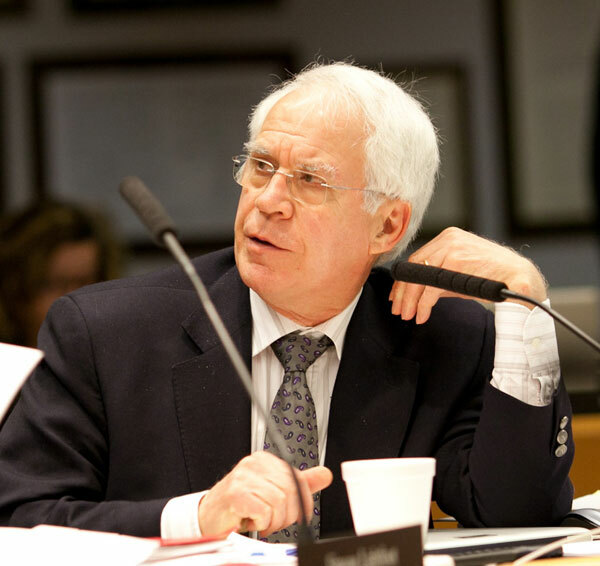 He noted that while other districts in Washtenaw County have experienced growth in the general education population, AAPS has seen an increasing “market share” of special ed students. He said that must mean the special ed services are part of what people find attractive about AAPS. Nelson also highlighted the financial consequences of special education enrollment. In 2012, $34 million was spent by the district on special education. About $23.7 million of that will be reimbursed by the state [roughly $6.3 million] and by the Washtenaw Intermediate School District (WISD) special education tax millage [about $17.4 million]. Even factoring in the state’s foundation allowance that the 390 FTE special education students bring to the district, the district still has to cover about $6.8 million of the cost out of the general education fund. If that $6.8 million is divided by the 390 students, the district pays over $17,000 per special ed student, Nelson said. Nelson wanted to draw attention to the costs of special education as it currently is structured and how that impacts the budget. Trustee Christine Stead also pointed out that the district is really spending $87,000 per special ed student, but that they are currently being reimbursed for all but $17,000 of it. Trustee Simone Lightfoot noted the reimbursement from WISD will be diminished in upcoming years. For the 2012-13 school year, WISD will reimburse 67% of special education costs. In 2013-14, that number drops to 56%. In 2014-2015, it drops further to 49%, and in 2015-2016, that number bottoms out at 46%. As reimbursement declines, Lightfoot asked, how can the district be expected to maintain the same mandated level of services. Brown said that was why they looked at the structure of how services were being provided. The district wants to move towards more inclusive environments that are the least restrictive for students. And while appropriate services for each student would still be provided, not as many special education dollars would be spent if the services were more inclusive. In an educational system that offers more choice, Nelson said, there are going to be providers who search out the low-cost elements of the educational mission, which are typically K-8 general ed students. Charter schools do not have to accept the higher-cost students. That leaves special education and high school students the responsibility of the public schools, he concluded. Nelson argued that the dynamics over time are going to mean that the high-cost providers will find it unsustainable to deliver that kind of education. There needs to be a partnership between general ed and special ed to have strong, viable programs for both, or else, “we’re in trouble,” he concluded. Responding to a question from trustee Susan Baskett, SISS assistant director Erik Thompson clarified that a targeted resource room was not a federal or state term, but one developed by AAPS. He explained that the program began as a kindergarten transition for students who had problems with social communication and who required more time and services than could be allotted in a half-day kindergarten program. The rooms were housed at Angell and Lawton elementary schools. Now that the district offers all-day kindergarten, he said, services can be provided at neighborhood schools, because all schools have resource rooms and speech and language pathologists. That push for inclusion, Butler-Ketchum added, will help set the bar higher for students. Stead said the board would be interested in a more data driven presentation. While a lot of the information already exists, having it coalesced would help the board. She said the Ann Arbor Parent Advisory Committee (AAPAC) did a fine job of identifying some of the areas where data is needed. She also said that as the district is already spending close to $90,000 per student, she would hope the whole SISS team would think about cost effective ways of implementing services for students. Outcome: The board asked for a data-driven component of the report to be presented at a future meeting. If the meeting turns out to be a committee of the whole meeting, AAPAC would be specifically invited. During the Ann Arbor Parent Advisory Committee (AAPAC) association report, Heather Eckner, AAPAC representative, addressed the SISS review. She thanked Brown and the SISS team for including AAPAC members in some data collection. She followed that by saying the committee was troubled by the lack of data on student achievement or student outcomes from the program review that had been designed and conducted by SISS. In the absence of such data, AAPAC believed it would be premature to make significant changes to the services or programs serving special education students. They urged the board to maintain the current practices of using separate, leveled classrooms for students with mild and moderate cognitive impairments, and to maintain or expand targeted resource rooms for early elementary students with developmental delays. Eckner also highlighted current special education law, and pointed to a conversation board had at its Feb. 27, 2013 meeting about teacher assistants being written into individualized education plans (IEPs). AAPAC’s position is that that the district is reimbursed for a significant portion of the costs for special education, and the trustees should keep that in mind when talking about the budget. Several parents addressed changes in special education during public commentary. Karen Underwood thanked the district for the support her daughter had received in a targeted resource room at Angell. She questioned why the SISS review didn’t come until mid-March, as it gives special education families little time to consider other options. She also asked how special education services were going to be expanded throughout the district, given the budget constraints. Patricia Memmet said she was dismayed to hear the board looking into pressuring the IEP teams to reduce support for special education students, and she thanked the trustee [Mexicotte] who had previously suggested that would not be compliant with the law. Memmet asked why a board certified behavior analyst (BCBA) hasn’t yet been hired. This was a gaping hole in the staff, she contended, and could be contributing to increased costs for additional teacher assistants. Paula Goforth was also concerned about the elimination of the targeted resource rooms. The targeted rooms, she said, provided the social and emotional components that kids need and they have really helped her son blossom. She was concerned that parents don’t know what other viable options might be, if the resource rooms were removed. As part of the budget reduction process last year, in 2011-2012, relocating the Roberto Clemente alternative program was discussed as a potential reduction of approximately $400,000. The administration’s recommendation was to relocate Clemente to Pioneer High School as a cost-saving measure. At the time, the trustees decided to leave the program intact, but charged the administration with doing a review of the program. When the board had originally heard the review, at its May 16, 2012 meeting, AAPS administration presented a set of information for board review, including a large amount of data on achievement, student make up, attendance, graduation rates, staffing, course offerings, and cost comparisons between the six district high schools. The administration used a similar approach this year at the board’s March 13, 2013 meeting. After conducting its review, the administration’s recommendation remains unchanged: Relocate the Clemente program to Pioneer High School. While there would be a change in location, Flye said, the service model would stay the same. The program would be intact, and the same number of instructional FTEs would be in place. The administration proposed two different options. Option A would yield a total potential savings of $348,677. The savings in Option A are realized by eliminating the principal and the office professional, as well as yielding savings in the areas of transportation, energy, maintenance, custodial, and ITD tech support. Option B offers a total potential savings of $127,379 – by leaving the principal and office professional positions in place for the initial year of transition. In either option, any sinking funds or bond money currently allocated for the Clemente building would be redirected to improving the program site at Pioneer. The next steps, according to Flye, would be to collaborate with the Clemente and Pioneer principals to develop an action plan. Flye acknowledged that Pioneer principal Cindy Leaman has begun to brainstorm considerations to keep in mind to help ensure a smooth transition, if the program is relocated to Pioneer. Pioneer administration is “confident” the building has the capacity to house Clemente. While Pioneer currently is technically over capacity, there is some flexibility with room configuration in the building, according to Trent. One of the benefits to moving Clemente students to Pioneer, according to AAPS administration, would be that the Clemente students would have greater access to more opportunities. Flye reported that Clemente’s current principal, Ben Edmondson, would prefer to keep to keep the program at its current location. Issues such as uniforms and a dedicated space were some of the concerns he expressed. [Clemente students wear uniforms.] He also said he would welcome the opportunity to talk to the principal at Ann Arbor Tech High School about housing the program at A2 Tech. Retired Clemente principal Joe Dulin weighed in during public commentary, saying that if the proposed move of Clemente to Pioneer goes forward, “we are headed for some serious problems.” He recalled the time that Clemente was housed at Forsythe Middle School – which lasted less than two weeks – as a negative experience. Several of the trustees were appreciative of the work that went into the report. Lightfoot, however, was troubled to have the “same suggestions we had last year.” Thomas said he had hoped the board would receive an evaluation of the effectiveness of the Clemente program. That qualitative aspect was something Baskett had asked for at the May 16, 2012 meeting. Flye responded that they found that the strengths of the program included its smaller learning environment and the relationships developed between teachers and students. It was not surprising that Clemente scores would be lower when compared to the comprehensive high schools, Thomas said, given the fact that the students at Clemente were struggling already. The 88.24% graduation rate at Clemente, however, was striking to him. If the end result, Thomas allowed, is to graduate a student, then Clemente seems to be effective. But he added, “If the result is to attain a certain measurable standard of learning, the outcomes are not good.” He wondered if the end results were any better or worse than if those students had attended a comprehensive high school. Responding to a question from Thomas about how the culture of Clemente would be maintained if moved to Pioneer, Flye felt the culture of Clemente could be preserved. The same number of classrooms would be provided at Pioneer, and there would be room for Clemente staff to work together. To address issues of mixing between Clemente and Pioneer students, there was some brief discussion on a separate entrance to the D-wing of Pioneer where the Clemente program would be housed. Flye responded by saying that the relationship component of student and teacher is a strength, and will remain the same. The 15:1 ratio of student to teacher will be maintained at Pioneer. She also noted that the principal of Clemente would have the opportunity to be part of the summer school experience. Trustee Irene Patalan also emphasized the importance of leadership. She wondered who would be in charge of the Clemente program at Pioneer, who “would be the glue to hold them together” if there were no principal or office administrator. She shared some of her own family’s experience with the Middle Years Alternative (MYA) program, which was housed at Forsythe. She emphasized that having some leadership was an important component to the success of a school within a school, but ultimately, she could see the relocation working. MYA was not a good example of a “school within a school” because it was ultimately closed, Baskett contended. The administration had not convinced her that they would be able to sustain at Pioneer the qualities that makes Clemente successful. She was concerned the district was not thinking through all the details of the day-to-day operations. If a Clemente student gets into an altercation with a Pioneer student, she asked, who would be in charge? Baskett also pressed the administration on how student success would be ensured if Clemente students were moved to Pioneer. The students there would not have the same kind of “TLC” from all staff that they are able to have at Clemente. Lightfoot also noted the irony of sending students back to Pioneer – the school from which the majority of Clemente students are referred. No one was pleased with the achievement scores at Clemente, said Flye. She mentioned the instructional team had been exploring distance learning components at the comprehensive high schools, which could be additional resources for Clemente students. Baskett disagreed, saying the metaphorical and physical arms that Clemente teachers wrap around their students are key. She didn’t think distance learning would work for Clemente students. The question for Nelson was: Where could the least amount of harm be done when viewing the budget as a whole? They were looking at this option because “we’re forced to cut money from the budget.” Green assured him that they were not bringing forward any item separately. She recognized, however, that they were making plans for each of the potential reductions being considered. Lightfoot wondered when the administration’s recommendation switched from housing Clemente at A2 Tech to housing it at Pioneer. Flye answered by saying that they had conversations with all the high school principals last year to discuss several options. It was ultimately decided then that there was not enough physical space to combine both programs at A2 Tech – and both principals at A2 Tech and Clemente were opposed to the combination. Lightfoot also encouraged the administration to solicit ideas from Clemente students, families, and faculty. She asserted that “too many decisions are being made in Balas [the central administrative office]” without the input of the people most impacted by those decisions. Flye said they know parents appreciated the experience students have at Clemente. That was one of the reasons that they are looking to keep classrooms together if the program does end up moving to Pioneer. As a possible revenue generator, Lightfoot suggested looking into recruiting more students to Clemente. She also asked that they be more creative than just eliminating programs. If the district is going to be committed to the program, Lightfoot maintained, it shouldn’t be sent “hobbling along.” Students had limited other options for alternative education, Lightfoot said, especially since the Center for Occupational & Personalized Education (COPE) closed its doors in 2012. On a different topic, both Lightfoot and Baskett questioned the admissions process to Clemente. Lightfoot said that previously students could opt to go directly from middle school to Clemente – but now were required to spend at least one semester at one of the comprehensive high schools before being able to transfer. That seemed to be a punitive approach, Lightfoot contended. Some of the issues that would have to be addressed if Clemente were to be housed at Pioneer would be the possible wearing of uniforms by Clemente students. Clemente students would potentially switch to semester scheduling as opposed to the trimester scheduling currently used at Clemente. Baskett argued that trimester scheduling was used at Clemente for a reason – credit recovery. The connectivity provided by the longer classes are important to the success of Clemente students, she concluded. Some of the trustees asked about the impact of combining summer school programs. Before 2012, Clemente offered its own summer school program. Because of budget cutbacks, the trustees voted to have all the secondary summer school programs at one site – Pioneer High School. Flye told the board it was a smooth transition to one site. Because it was so successful, she said, the district will be continuing it for the 2013 summer school program. She said they had initially received lots of feedback from parents who had reservations about transitioning the summer program, but once the program started, they did not hear any more concerns. When pressed by Baskett for some written documentation of that feedback, Flye said they are putting in place a complete review of the summer school program. Baskett maintained that summer school would have been “a nice pilot to measure the social interactions” between Clemente and non-Clemente students. Outcome: This was a review requested by the board. There will be more discussion on Clemente as the board considers the budget as a whole. No action was taken at the meeting. The upcoming budget decision for FY 2013-14 emerged as a topic throughout the meeting. The meetings would need to be sub-quorum [only three or fewer trustees], and Nelson said it would be “something of an experiment.” Since they have heard criticism that the traditional forums were not informational enough, the smaller gatherings would allow for more input from the community. With projected action on the budget coming before Memorial Day, the hope would be that members of the community would have enough time to adjust to whatever changes will be coming. Nelson envisioned that the trustees present at each meeting would describe what it is they are facing and a list of the various options. Attendees would be encouraged to do three things: (1) address ideas for additional revenues; (2) identify the core areas that must be protected; (3) and find the areas where $17 million (almost 10% of the district budget) can be cut. Stead noted that the costed-out information was going to be important for trustees to have – to give the public a sense of scale. Lightfoot also noted that as trustees look at the budget, they keep in mind and suggest to the public the importance of restructuring and amending rather than ending. She said they were looking to the public to come to the meetings with ideas that could possibly be implemented. She also highlighted this point when talking about the proposed relocation of Clemente. Thomas said he has received a number of emails over the past week about possible cuts to the funding for the district arts programs. “We get it,” he said. But the problem, he argued, was that nobody wants to cut anything, and the district is still faced with a $20 million deficit. He suggested that as a district and as a community, they need to get behind some charitable contributions in support of the arts. He suggested donations to the AAPS Educational Foundation as a way to support the arts so they can save some of the programs that are so clearly valued by the community. Board vice president Christine Stead presided over the meeting, as president Deb Mexicotte was absent. 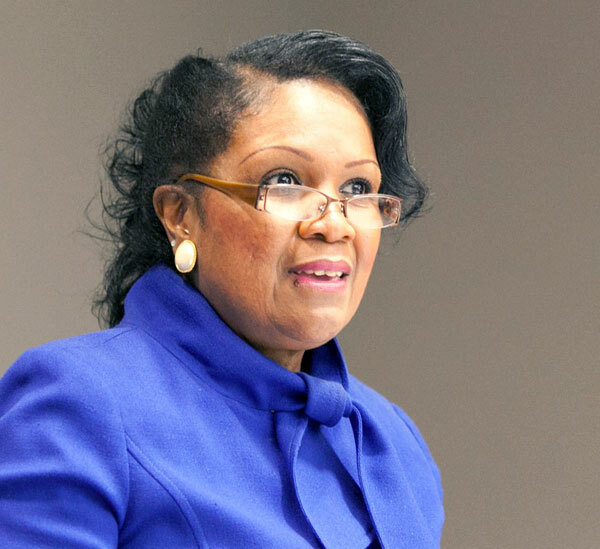 Lightfoot mentioned she had attended a Education Achievement Authority (EAA) board meeting at EMU and was struck by the “egregiousness” of the legislation. The workings of the EAA have siphoned off some of the district’s students, without incurring the kinds of costs the public schools have. She said that while residents’ frustrations are directed at the board, they should instead be directed at the governor and state legislature. Stead noted that it was districts like AAPS that had been giving the most since funding from proposition A was started [in 1996]. Nelson thanked Stead and the others who organized the Michigan board of education forum on state legislation that could impact public education, which was held on March 11, 2013. It was a forum “we could all be proud of.” Stead said she is following up with the panelists to pursue the possibility that they would remotely answer some of the questions from the community. Two people spoke during public commentary about the budget and issues with the administration. Barbara Malcolm said she was “outraged at what seems to be back alley deals” when it comes to the budget. She said the board should be distrusted and ashamed for bringing in “outsiders who have no connection to the community.” She asked for more transparency when it comes to the budget. As they have for the past three years, the trustees approved limited school of choice (SOC) openings for the 2013-2014 year. Under the limited option, a school district must identify the number of openings and can open an application window for only 30 days. The district is offering the following SOC openings: 40 seats in kindergarten; 40 seats in grade 1; 10 seats each in grades 2 through 5; and 50 seats in grade 6 for the 2013-14 school year. These numbers are consistent with what was offered last school year. New for the 2013-14 school year, the board also decided to add 25 seats in grade 9 at Skyline High School. This was not consistent with the administration’s recommendation. Because the district could not accommodate all the requests for in-district transfers at the high school level, the administration did not want to open up any high school for SOC. The trustees were in agreement that it made sense to open Skyline up for SOC – because enrollment at the school was down. While there are 100 open enrollment seats for students who reside in the district but live outside the Skyline boundaries, not all seats went filled for the 2012-2013 school year. In a time where “we are talking about eliminating all these programs, it seems unwise to leave an opportunity untapped,” said Thomas. Nelson noted that because Skyline has smaller class sizes than either Huron or Pioneer, it was likely that an addition of 25 students could be absorbed with no increase to FTEs. Each SOC student brings in the corresponding foundation allowance from his or her own school district. Thomas also mentioned that if they did not open up the seats, the district would possibly be looking at a reduction of teachers at Skyline – to bring staffing levels more in line with the other comprehensive high schools. The administration’s recommendation is to give it some time to see how in-district transfers between high schools works, before opening up a high school to SOC, Green said. But if the board wants to try opening up Skyline for SOC, and the board and the administration is “all on the same page that this is an experiment,” she would not delay doing it. Flye said the administration will still be monitoring in-district transfers. After receiving a sobering second quarter financial report at their Feb. 27, 2013 meeting, which showed a $2.5 million gap, the trustees amended the general appropriations in the current year’s budget and approved the second quarter disbursements. The formal amendment to the budget was made as part of the board’s approval of the consent agenda. The second quarter financial report shows the projected revenue will be approximately $1,088,000 lower than expected. The decrease is due to adjustments of the number of budgeted general fund FTEs to the audited student account, along with other reductions. The expenditure budget will be approximately $1,394,758 higher than originally projected. The increase is due to an $894,758 increase for an additional 24 teacher assistant FTEs and a $500,000 adjustment to basic programs for projected substitute teacher costs. While acknowledging that it wasn’t going to close the $2.5 million gap, Green said they have implemented a limited budget freeze. For a purchase or a requisition to be approved, it first must be approved by the appropriate executive cabinet member, then by Green herself. This was met by approval from the trustees. Patalan said she appreciated the initiative. Stead said that since the public didn’t always understand the estimations that go into the budgeting process, she wanted people to become more aware of the work being done by Green and her team to address the current financial situation. Green acknowledged they were trying to “level out the organization” at the administrative level. That means the administration is not going to be filling Robert Allen’s deputy superintendent for operations position. But Linda Doernte’s director of purchasing and business services position will be filled when she retires. Green also said they would be looking at some more creative ways of cutting expenses. She noted a proposal had come forward to cut down on graduation costs, as had a proposal addressing table rentals. Outcome: The board approved the second quarter financial report as it was presented. The board was asked to give final approval to two purchases. After receiving an initial briefing on the item at its Feb. 27, 2013 meeting, the board voted to approve a purchase of 103 Lexmark copiers at a cost of $360,000, funded through the technology bond. It has been verified with the district’s bond counsel that this would be an allowable expense for the bond. The purchase represents a one-time savings of approximately $25,000 over the lease option. Because the lease was a budgeted expense in the general fund for the next three fiscal years, a savings of approximately $130,000 annually will be realized in the general fund. The savings from the copiers will most likely be used to offset the costs of a software upgrade, which cannot be funded through the technology bond. The trustees approved a district-wide replacement of classroom projectors, approximately 200 sound amplification systems, and supporting electrical equipment. A request for bids on the project went out on Jan. 10, 2013. Bids were received and publicly opened on Feb. 5, 2013. After various companies were interviewed by the district’s technology bond professional team, the team recommended the following contract awards: Great Lakes Power and Lighting ($393,000 for electrical work); The Professional Group ($1,879,619 for audiovisual equipment); and to AVI-SPL ($183,168 for the sound amplification systems). Brief discussion centered around the business practices of Great Lakes Power and Lighting after some complaints were brought up during public commentary at the Feb. 27, 2013 meeting. Trent said that after internal discussion, none of the complaints changed their recommendation of the companies. Lightfoot made clear she would not be supporting the contract because of letters from the state’s Department of Labor and Economic Growth from 2008 that state that Great Lakes Power and Lighting was not in compliance for pay. Outcome: The board approved the purchase on a 4-2 vote. Baskett and Lightfoot dissented. With limited discussion, the board approved both Plante Moran as the financial auditor and renewed the district’s liability insurance. The trustees were initially briefed about both topics at the Feb. 27, 2013 meeting. Plante Moran, the district’s previous auditor, was awarded the district’s financial audit contract for a cost of $161,000 over three years, with the potential for two one-year renewals. Nelson was pleased to hear that there would be some change in the team from Plante Moran. He was initially concerned that there could be too much familiarity – if an auditor had been with the district for an extended period of time. The trustees also voted to approve the district’s liability insurance renewal. The district’s final liability insurance premium will be $716,476. The renewal premium reflects an overall increase of 5.9%, which is less than current market conditions. A National Flood Insurance Program (NFIP) policy was purchased this year because Affiliated FM identified eight buildings located in a low hazard flood zone as locations that are “at risk.” Affiliated FM would insure those buildings only with a $5 million limit and a $1 million deductible. Because this was a large deductible that could potentially put the district at financial risk, the additional NFIP from Selective Insurance was purchased to cover the gap, which would insure the buildings up to $1 million with a $1,000 deductible. The NFIP coverage goes into effect March 6, 2013 and costs an additional $30,732. All policies except the NFIP coverage went into effect Feb. 1, 2013 and will expire on Feb. 1, 2014. The trustees weighed in to support three district students who face criminal charges as a result of a “brawl” that took place at the conclusion of a football game last year. The game took place on Oct. 12, 2012 between Huron and Pioneer high schools, both schools in the AAPS district. 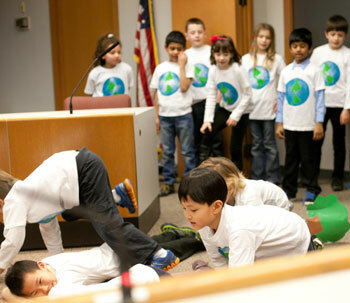 A hearing for one of the students had been scheduled for March 15, 2013. During public commentary, five members of the public spoke in support of the three young men. Joe Dulin, retired Clemente principal, speaking on behalf of Ann Arbor Concerned Citizens for Justice, said that while no one in the group applauds that someone was injured during the brawl, they felt there was injustice done by “overcharging” the students. He asked that the board remedy the situation. Ruth Zweifler asked the board to “stop criminalizing our students” because it just creates more problems than it solves. Leslie Hollingsworth noted there was an overrepresentation of African American students who face expulsions and suspensions in AAPS. She asked that board call for the dismissal of charges against the three students. Sioban Harlow encouraged the board to support the students and bring the issue back to a dialogue rather than a criminal proceeding. Lefiest Galimore also expressed his support for the young men. We therefore further recommend that the Prosecuting Attorney, Brian Mackie, consider the best interests of the injured student, the students criminally charged and the community by re-evaluating the degree of criminalization of adolescent behaviors that would be better resolved through a greater emphasis on educational and developmentally appropriate measures relative to harsh charges and convictions. Both Thomas and Patalan had initially expressed concerns about the board becoming involved in a matter that has progressed into the criminal justice arena. After some small changes made to the proposed resolution and after having listened to the concerns expressed by the community, Thomas said he was able to support such a resolution. Patalan said she read the resolution with an eye for an affirmation for all of the district’s students. Feeling satisfied that the resolution could be true for every student, she was content to support the resolution. After some discussion by the trustees, it was decided to change the word “resolve” to “recommend” in the last paragraph. This decision was made because the resolution was supposed to be suggesting an action for Mackie. Outcome: The board unanimously approved the resolution, with the understanding it will be sent directly to Washtenaw County prosecutor Brian Mackie. At the March 13, 2013 meeting, the board heard from AAAA and AAPAC. The AAPAC report is included in the write-up of the SISS review. Mike Madison, co-president of AAAA, recognized several administrators who were leaving their jobs in the near future. He commended Robert Allen as someone who “you could always get a straight answer from.” He also congratulated Selura Jackson on her new job assignment in North Carolina. He encouraged the administration to fill the vacancies from the ranks of AAAA. And acknowledging there were “tough times ahead,” Madison read off 31 suggestions from the members of AAAA on ways to reduce the budget. The suggestions ranged from selling buildings off, to cutting central administration jobs and pay, to adding five to ten minutes to each day with the end goal of ending school two to three weeks earlier. Madison stressed that the suggestions were not his ideas but were the consensus of AAAA’s collective thinking. He noted that over 75% of their members supported the recommendations. 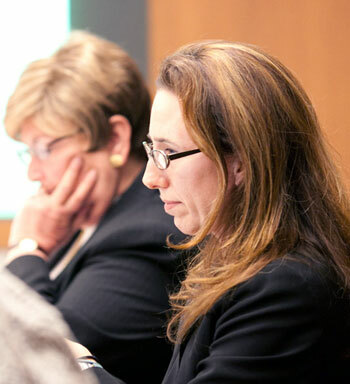 During agenda planning, Nelson pointed out that one of the board’s duties was to elect members to the Washtenaw Intermediate School District (WISD) board. Terms for two of the members will be coming to an end in June of 2013. Members of WISD’s school board are elected by a body of electors composed of one member from each WISD member district’s board of education. So AAPS has a vote in the WISD elections. Nelson proposed the board be more systematic in its approach to voting on WISD elections – having the two incumbents who were up for re-election this year to come speak to the board. He suggested inviting Diane Hockett and Mary Jane Tramontin to the March 27 meeting to explain their platforms and why they were running. By having the incumbents present, Nelson suggested, the board would be in a better position either to support the candidates or encourage someone else to run. He also noted that one of the reasons he wanted to draw attention to this was the low barrier to candidacy: Running for a position on the WISD board requires only submitting a nominating petition with the required number of signatures. Outcome: The board will invite the two incumbents to the March 27, 2013 meeting. In her superintendent’s report, Green highlighted many student and teacher achievements across the district. She noted three groups of Pioneer High School students who were among the winners of C-SPAN’s StudentCam documentary film contest. Art students, art teachers, orchestra teachers, music students, and students of Japanese were among those recognized for their accomplishments. The board meeting was started off by two songs from Susan Bailey’s second grade classroom at Lawton Elementary. They were led by Cynthia Pagebogen, who had taught several of the trustees’ children when they were younger. The songs blended science, dance, and music. The trustees were effusive in their praise. Baskett said she had never seen such enthusiasm at a board meeting. Seven members of the public spoke to express their support for the drama programs at the high schools. Eliminating district funding of theater for a savings of $200,000 is one of the items being discussed in as a possible cost cutting measure. Sena Adjei, surrounded by other high school theater students, spoke against cuts to the theater program. Several students spoke about how theater has been an integral part of their high school experience. Sena Adjei said he became more of a man in the first ten minutes of theater than he ever did playing football. Gabrielle Vuylsteke offered some examples of students who had had their lives changed by theater. Pioneer student Kate Summers shared her own story of how her theater experiences helped grow her confidence. Eleanor Howell-Shryock, a member of the Huron Players, said that “no matter how much money we might be save [by cutting theater], we can’t afford it.” Having the theater budget at Huron cut would be the death of them, she said. Several parents spoke in favor of maintaining theater funding. Margie Morris, a district parent, asked that the board keep in mind how many students would be affected by the cuts. Brice O’Neal credited theater at AAPS for saving his life as a high school student. He asked that the board consider what the impact of these cuts will mean to the students. Jeff Crause pointed out that all other proposed budget cuts were a percentage of the programs, while theater would sustain a 100% cut in its budget. He also noted the high caliber of theater in the district. Any additional fundraising the students would have to take on would be a subtle tax increase, he argued. 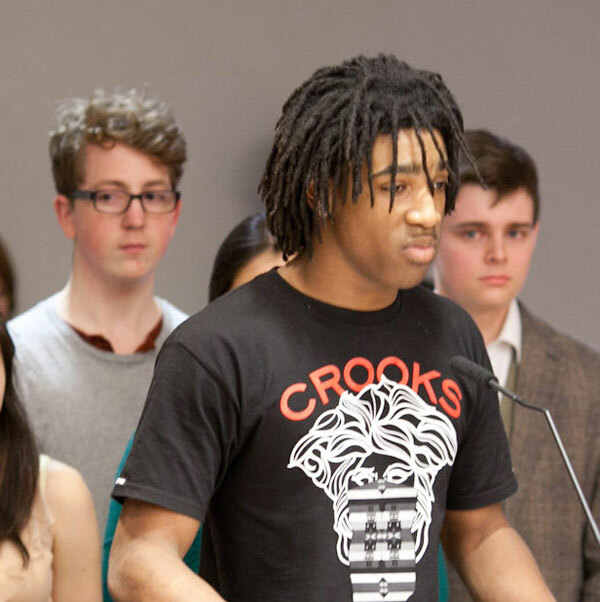 Isaac Scobey, Community High School student, argued for block scheduling at Community to be maintained. He asserted it was part of what makes Community unique and it gives students time to reach deeper into subjects. Present: Vice president Christine Stead, secretary Andy Thomas, treasurer Glenn Nelson, and trustees Susan Baskett, Simone Lightfoot, and Irene Patalan. Next regular meeting: Wednesday, March 27, 2013, 7 p.m., at the downtown branch of the Ann Arbor District Library, 343 South Fifth Ave.
Reading this article, about an organization facing 10% of budget deficit, but mainly concerned about new projectors gives a surreal feeling. The waves are washing over the sides and the officers of the Titanic are discussing changes to dinner seating. In the past I have supported funding for AAPS including some millages but not any more. All this manufactured crisis so that public money can finally be transferred to private schools. The teacher’s have agreed to 3% cuts added to 2% cuts within the last 5 years. It is time for the administrator’s to step up and take their cuts as well. My property taxes haven’t gone down one bit. Where is the money going? How is it there is no outrage when the U of M hires a $400,000 a year lawyer to assess risk? Isn’t he a public employee? The level of ignorance presented by the BOE regarding special education is amazing. There are NOT 390 students with IEPs, that number is the staff allocated to special education. There are actually about 2,000 students with IEPs in the district. So the $87,000 per student is wrong by a factor of 5. And there are people at that board table who should know better. Shameful. While the article correctly reports the remarks on Special Education expenses and reimbursements made by trustees Glen Nelson and Christine Stead, they were both incorrect in how they used the Full Time Equivalent (FTE) number for special education students. Per the Michigan Department of Education web site, special education student FTE are the sum of all the time each individual special education student was receiving Special Education services on the most recent Student Count day. Since the large majority of Special Education students spend almost all their time in general education classrooms and receive accommodations but no services. Those students generate only 0.16 FTE if they attend an Academic Support or Resource Room for one class period each day, and only 0.014 FTE if they participate in twice-monthly therapy or skill-building groups. The correct base for calculating both the average expenditure per Special Education student and the amount those students generate in Foundation Allowance is the number of students with IEPs. In Ann Arbor, that number is much closer to 2,000 than 390. And so, in Trustee Nelson’s example, the district needs to use $10.3 million of the approximately $18.9 million generated by the foundation allowance for special education students to cover the costs of the special education services they receive. This is a difference of over $11 million to the good vs. having to spend almost $7 million of general fund dollars beyond the general fund revenue generated by enrolling special education students. Also, in spite of Dr. Elaine Brown’s assertion in the SISS report that appropriate support of students with disabilities is less expensive when delivered in a “more inclusive environment”, redistributing the students now served primarily in one self-contained classroom into as many as 10 different neighborhood schools will require up to 10 teaching assistants to appropriately support that group of students versus the 2 now in place. The general and special education teachers in 10 different schools will be required to learn how to adapt and modify lessons for each specific new special needs student in their building, instead of leveraging the expertise that has already been developed in the schools hosting each particular leveled classroom or targeted resource room. Parents are rightly concerned that their students will NOT be appropriately or effectively supported when attending neighborhood schools where the staff is inexperienced at educating students with those particular disabilities. Nor is there a plan to develop the needed skills and knowledge by the teaching staff or hire and train the parapros needed in all affected schools in time for the start of the 2013-14 school year. I’d kind of like to see the administration say to the Roberto Clemente community–staff, parents, and kids–we will need to move your program, either to the Ann Arbor Tech/Stone School building, or the Pioneer Building. Which would you (not Ben Edmonson, but everybody) prefer? The cost savings could be similar either way. I appreciate the school board asking for metrics on special education data. In that spirit, I think it would be really helpful to describe the cost of special education students in a range. The average special education student might cost the district $17,000/year, but the majority of special education students cost a lot less–or to use the median. The average is skewed by a small group of students with severe disabilities who cost a lot. Most students with IEPs have fairly mild disabilities (often speech or reading disabilities) and only need a small amount of assistance/accommodations. Further, it’s not true that charter schools “don’t have to take” special education students. They are supposedly required to do so. [Read more here, starting at question 54: (link to .pdf file)] The fact is that they do often discourage their special education students from continuing, and they should be held accountable. On the topic of Community High’s potential switch from block scheduling, would it really save money? This will be a fine topic to discuss at one of the community forums that are scheduled with board members in the coming month. The first one is Thursday evening March 28th, 7-9 p.m., at Clague Middle School. It bears repeating that charters schools are public schools and are every bit as obliged to provide special education services and at the intensity and level as traditional public schools. That’s the law. Now, they don’t seem to interested in that, but I believe, their boards too should be discussing their schools plans for special education starting with self contained classrooms on up to full general ed inclusion, with their special education staff,and, in particular,with their director of special ed (who is that, by the way at the EAA? ), and also with the parents of their students about what to do about things like the autism tsunami, etc and do it in televised meetings for the community to view, just like we do.